A statue of the comic Tommy Cooper has been unveiled in his hometown - just like that - by Hollywood star Sir Anthony Hopkins. Cooper - thought by many to be the greatest comedian of his generation - was born in Caerphilly, south Wales. 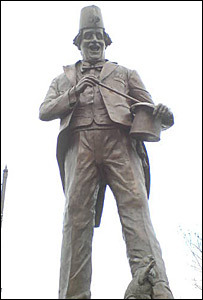 The 9ft (2.7m) bronze was sculpted by James Done who said Cooper would have been "the highest paid jester in any kingdom." Cooper died of a heart attack during a TV show in 1984. It ended a career built around magic routines which went wrong. He was born in 1921 in Llwyn Onn Street, Caerphilly, before leaving with his family as a small boy to live in Exeter. 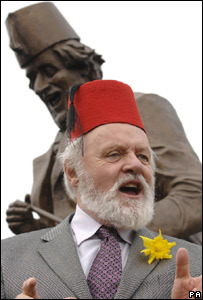 The Tommy Cooper Society was set up five years ago aimed at erecting a statue of the comic in the town of his birth. It raised £45,000 to pay for the statue. Standing on a 4ft (1.2m) plinth, the statue depicts himwearing his trademark fez and be located opposite the castle in the centre of the town. Sir Anthony, the society's patron, unveiled the statue after giving an impersonation of the late comic. Adopting an uncannily accurate Tommy Cooper voice he said: "Before I start I just want to say this; this. Or that. Or this is as funny as that." Sir Anthony then had the crowds in uproar with a comic set that recalled Cooper's finest moments. Later Sir Anthony said: "I just want to say what an honour it is to be here. "Tommy Cooper was a one-off. He was a kind of tragic comedian; that great big face of his and great big hands and his boots and that ridiculous fez. 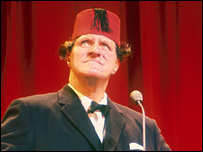 "I wish I had met Tommy Cooper but I never had that great privilege. But I have the privilege of coming here with his first cousin Bet and she is going to help me unveil his statue." He said the comic was a "one-off" and compared him to some of the greatest comedians of all time such as Charlie Chaplin and Buster Keaton. "He was the comedian's comedian because he was such a self mockery artist," he added. Cooper's daughter Vicky is a honorary member of the society and in a letter she recalled how proud her father was of his Welsh roots. The society's secretary Tudor Jones said: "She said her dad looked upon himself as a Welshman from the top of his black curly hair to the bottom of his size 13 boots." He added: "Tommy was always larger than life so it is fitting that his statue will stand proud in the centre of the town where he was born. "This will be a long awaited tribute to Tommy from his home town of Caerphilly."